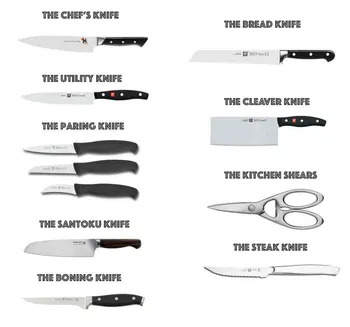 As a dedicated cook or professional chef, it is not unusual to have big sets of more than a dozen different types of kitchen knives in use at once. Is it complicated? It can be. Does it need to be that way? That depends on the amount of time you are willing to spend, and the level of precision and perfection you want your food to be. Using a knife designed specifically for a task just makes every cut a whole lot faster and easier, saving your head space from unnecessary calculating and envisioning. In fact, most people, even those who don’t cook at all, typically have at least 3 different blades for various uses. Usually more. My mom has 5, and she’s a vegan who only works on veggies and an unconscious minimalist who aspires to own as less as possible. And as everyone has or will have more than a knife or two, it doesn’t hurt to learn about the knives and how to use them in the way they are intended for. There are probably more than a dozen different kitchen knives, some versatile, others dedicated for extremely specific uses. The 10 knives in this list are the most popular knives for daily cooking and food serving jobs. They are the ones that make up the core of all professional as well as home cook’s knife sets. Also called a cook’s knife, this is the most important item in a knife set. The knife typically a broad blade tapering upward to a point, allowing the knife to rock back and forward for fast mincing. It’s about 6 to 12 inches long. A greater length usually translates to faster, easier slicing, but if you have small hands, a shorter knife would be easier to control. A chef’s knife can be forged or stamped. Most chef’s knives are unserrated, but some brands have also started to make serrated ones. The knife can be used for almost every task in the kitchen. It cuts tofu, chops squashes, dices tomatoes, and slices steaks. That is why it is the must-have item in every kitchen knife set collection, small or big. Usually between 4 and 7 inches in length, the utility knife is most of the time treated as a mini chef’s knife. It can come straight or serrated, and is good for cutting vegetables and meat that are too small for a chef’s knife. Utility knives often come with a scalloped edge for flexibility in cutting. It works perfectly for cutting soft as well as hard veggies, from tomatoes to squash. It is also very useful when you want to prepare lettuces, cabbage, and sandwich meat. The Santoku knife is a Japanese version of the Western-style chef’s knife. Santoku means “three virtues”, which are slicing, dicing, and mincing. Santoku’s are sometimes made with a hollow edge, which allows them to cut through meat and other sticky materials faster, with more precision, and minimal tearing. The knife is an all-rounder and can do almost everything a typical chef’s knife can. In fact, it’s used in place of the chef’s knife by some cooks, especially those with tender hands and prefer a smaller, lighter blade. The boning knife, as you probably have figured, is used for separating meat from bone, making filet fish, and cutting up meat. It is also a well-loved item by vegetarian – a small one can be used place of a paring knife for peeling and trimming veggies. Boning knives are typically about 3 to 8 inches in length, with slightly varying widths of blades. The blades can be flexi, semi-flexi, or stiff, with stiff blades being the most popular among home cooks due to the enhanced precision in the cut. Bread knives are used for cutting bread, cakes, and sometimes meat, poultry, and seafood. They are designed in a way that allows you to saw through the bread without pushing down or squishing it. Made to cut large chunks of bread, most of these knives are 7 to 10 inches long. The blades are usually narrow and always serrated, with big “teeth” along it. The cleaver is usually the bulkiest and weighted knife in the kitchen. A typical cleaver has a thick spine and a very strong blade, which allows it to cut through bones and meat in a chopping motion. It’s also very useful for chopping hard and thick materials such as squash or pumpkin. The wide, heavy blade makes it ideal for pulverizing cooked or uncooked meat, poultry and fish, and crushing garlic. A parer usually comes with a thin 3 – 4 inches blade and a very pointy tip. It can be used for cutting and peeling fruits, veggies, and trimming excess fat with precision and ease. The most common styles of paring knives include the spear point, sheep’s foot, and bird’s beak, named after the shape of the point. The Nakiri bocho is a Japanese style knife used mostly for cutting vegetables. It features a thin and wide blade and squared off tips. As it is designed for chopping veggies, the knife has a straight blade that can cut through long items (think eggplants, carrots) as well as make super thin slices out of cucumber, bitter gourd, tomatoes and the likes. This knife looks very similar to the boning knife. However, there are subtle differences between the two. Since a boning knife is designed to remove meat from the bone, it tends to be thicker and have better force endurance. The fillet knife, meanwhile, is made to cut thin fish slices and thus is typically thinner, longer, and more flexible. In fact, the distinctions are so small the two knives can substitute each other in most cases. Knife makers sometimes merge the two, hence the emergence of the boning fillet knife. If you’re a sushi and sashimi pro or a chicken boning pro, you’d probably notice the differences. Other than that, either of the two should be sufficient for casual home cooking. Which ones of these knives do you own? Do you prefer a chef’s knife or a Santoku for general cutting work? Are there any other important types of kitchen knives that you think should be in the list? Let us know in the comment section! I have all except the steak knife. I prefer the chefs knife and cleaver knife. As a casual home cook I use a Santoku and a pair of shears for almost everything. Plus a peeling knife. But my more dedicated cook friends actually own and make use of every single knife in this list, and even some rarer ones.